Hi crafty people, hope you are having great fall! Today's project is actually a technique experiment. I am going to create a shaker card with Grand Maple Frame craft die and add some color and pattern to a clear window using washi tapes. Washi tape is a very unique material - it's a really thin paper that is semi-transparent (especially the light colored one). So adding it to acetate will result in creating patterned areas that you can still see the sequins through. Watch the video tutorial below where I am demonstrating the entire process step by step! Thanks for visiting! Happy Tuesday! When I first saw the That's Acute triangle stamp set I immediately thought of Christmas trees. I love the simple and graphic look that these stamps give. I stamped the larger triangle with the lines in it first and started with the center tree. I left a little bit of space between each of the big trees for the smaller ones to get stamped in. The smaller lined tree got stamped in the spaces and I stamped them in a different and slightly darker green ink, it's a little hard to tell the difference in the photos but in person it makes a difference having the second color. 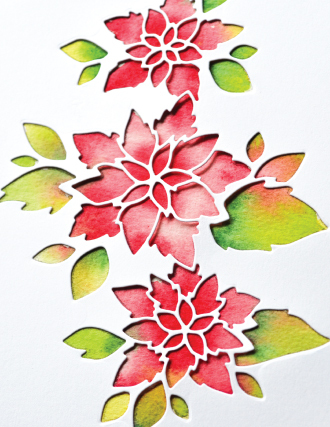 Then I stamped the Merry Christmas in red ink from the Bold Christmas greetings stamp set. I added some red gems to top the trees and finish them off. Fun tip, I didn't have any red gems so I used a red Copic marker to color some white gems and it works perfectly. It's a great way to make sure that your gems always coordinate in your projects! Hello and Welcome! It's Isha and today, I want to share a graphic CAS Christmas card using the new release products. 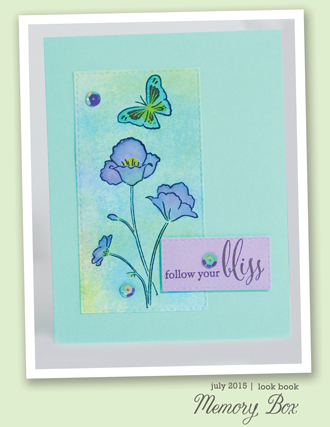 There are so many fun graphic stamps and a gorgeous background stamp in this release. To start, I cut a white mat layer and stamped the background using a very light grey ink. I then stamped the triangles in various sizes using 4 different colors of dye inks. 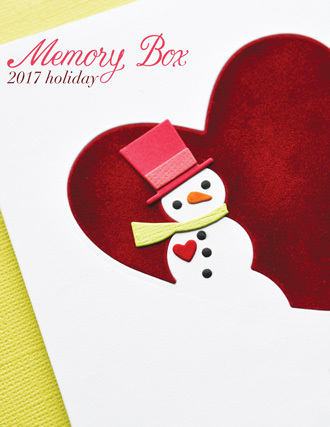 Then die-cut the word greetings and the winter frame using white cardstock 2 times, apply embossing ink and emboss using WOW! 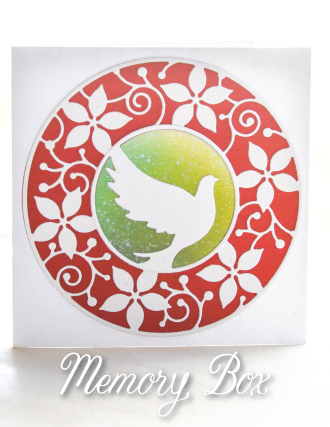 Silver Bells embossing glitter on one of them and then stack with the 2nd die cut. Now, I adhered a piece of vellum to the mat layer. 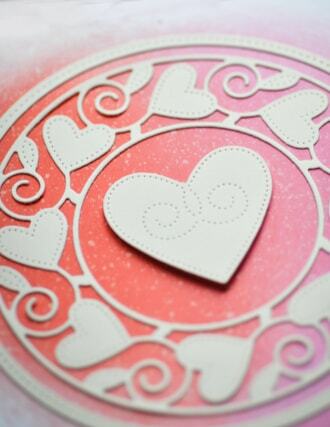 Adhere the embossed die-cuts. Adhere this mat layer to a grey cardbase. Hello, hello! Penny here today with my favorite holiday color combo. Nothing better than a Blue Christmas! 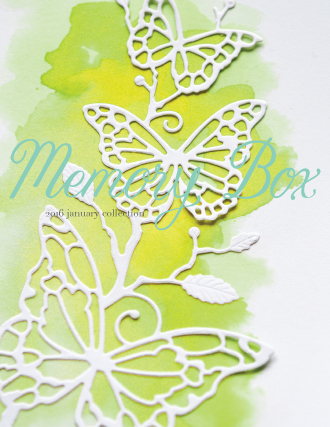 A little stamping, a little heat embossing, a little die cutting. 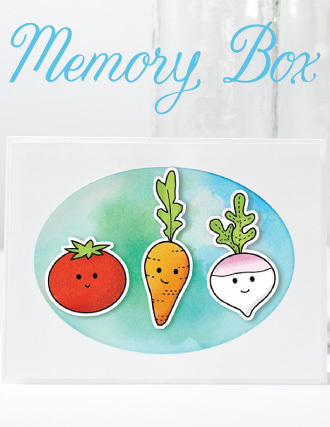 And really...how stinkin' cute is the background stamp?!? 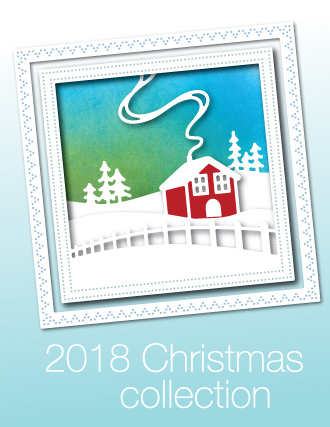 Probably my favorite Holiday stamp ever! 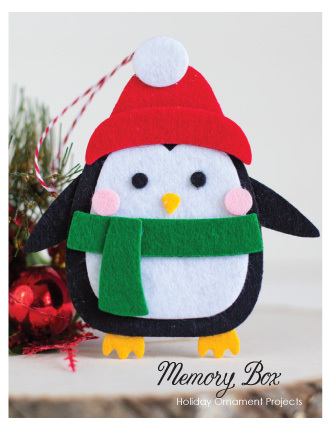 Start with a White cardstock base measuring 4.25 x 5.50 inches when folded. Round the upper right corner. 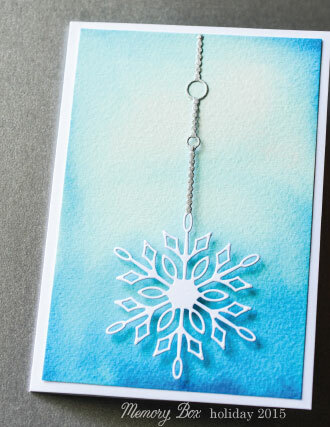 Stamp the card front with Typewriter Holiday Elements background and heat set with White embossing powder. Ink around the panel with Spectrum Noir Baby Blue, Ocean Blue, Midnight and Silent Night. I love the ombre effect! Stamp an strip of Navy cardstock with the sentiment and stripe from the Bold Christmas Greetings set. Trim the stripe and adhere to card front with foam adhesive as shown. 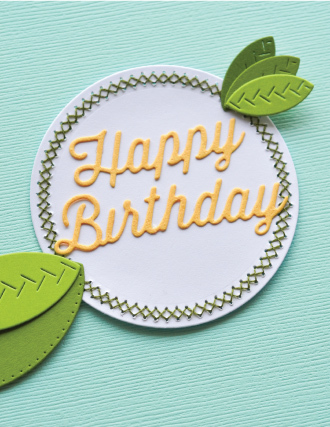 Die cut sentiment with Stitched Ovals. 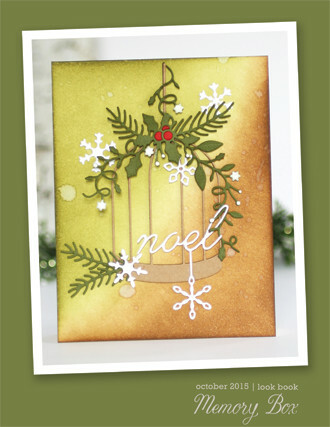 Finish the card by stamping the "25" with Spectrum Noir Silent Night ink and die cut or use a 1" punch. 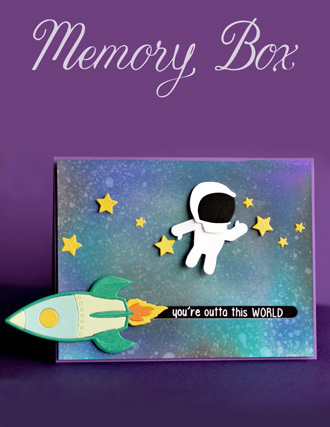 Adhere to card front with foam adhesive. 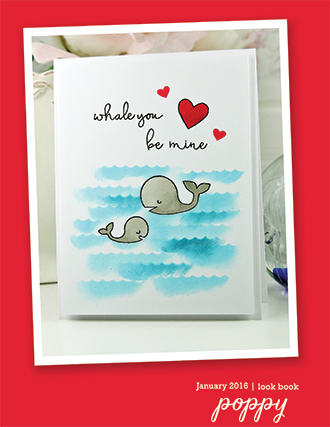 Not too frou-frou, so it would make a wonderful card for any men in your life. 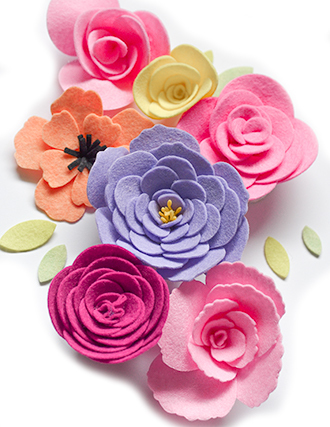 Happy Weekend crafty friends! Today I have a last minute Halloween card to share with you all because I don't know about you, but this holiday snuck up on me all of a sudden. Let's get started! 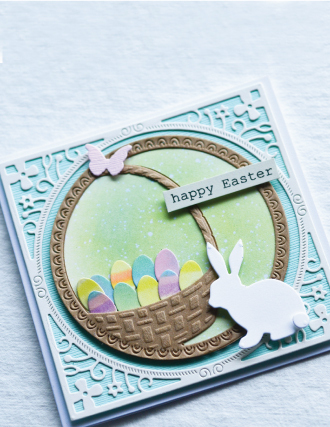 I started with the Cottage Gate Frame die and just used the circle portion with the gate as the base of my scene. I cut it in white and placed it on a purple circle. Then I cut the super cute Friendly Ghosts from white and then colored them with a clear glitter pen to make them sparkle. I love making my ghosts sparkle! 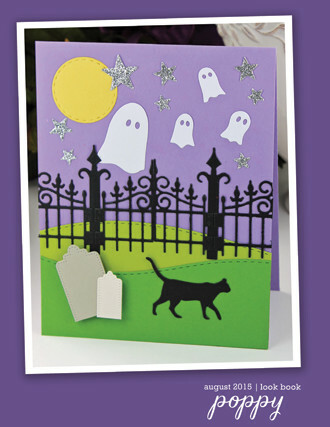 Finally, I cut the Cool Cat in black and glued it to the card. I filled in the eyes with yellow enamel accents to make them stand out in a spooky night scene. Three black gems add just a little bit of detail to the bottom left corner and finish off my card. I hope you have a fabulously spooky and fun weekend! 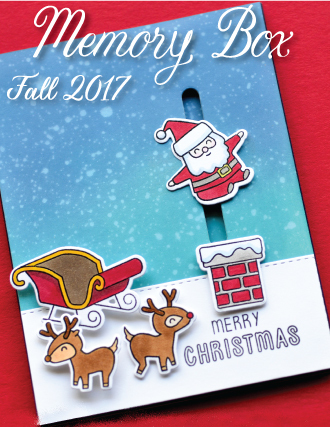 Today I have a Christmas card showcasing some of the new products from the 2018 Holiday Happenings release. 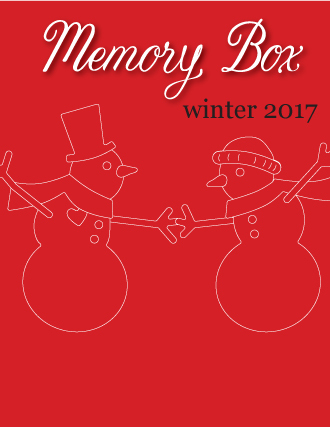 To make this card I began by stamping the Typewriter Holiday Elements background with Versa Mark ink on a white cardstock and heat embossed it using clear embossing ink. 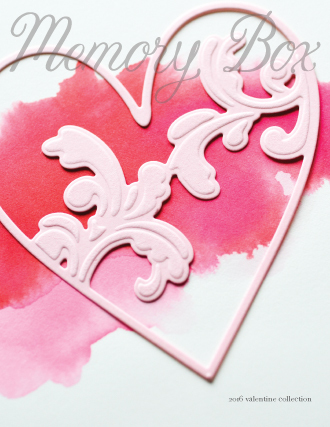 Next I sponged over the embossed image with Candied Apple Distress ink. 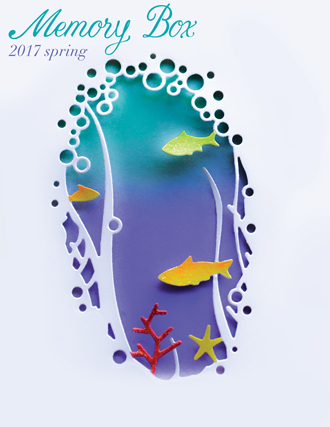 I cut my card front to size and die cut the Snowy Circle in the center of the paper. 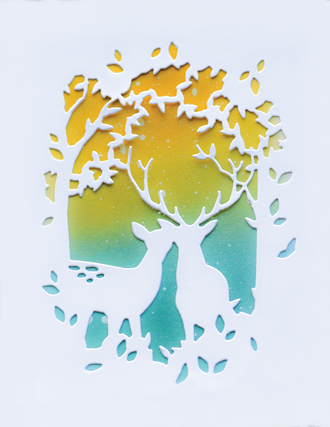 I die cut another Snowy Circle from white cardstock to use behind the trees. 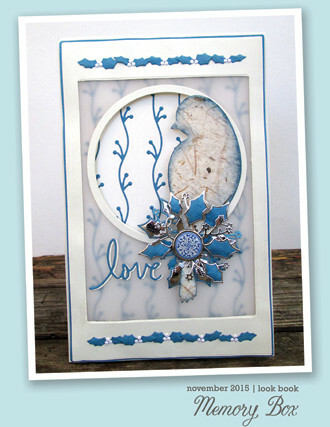 I glued a piece of silver metallic cardstock behind the prepared card front, then glued the white snowy circle in place. I inked several of the solid triangle stamps with green distress inks, misted them with water and stamped them on white cardstock. 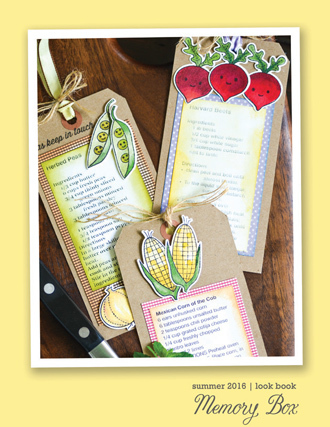 Once they were dry I stamped the triangle line images on top of the corresponding trees and die cut them. I spattered the trees with white ink before adhering then to bottom edge of the snowy circle. 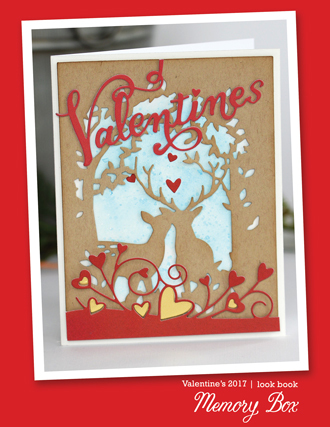 I used foam tape to adhere some of the trees to add some dimension to the card. 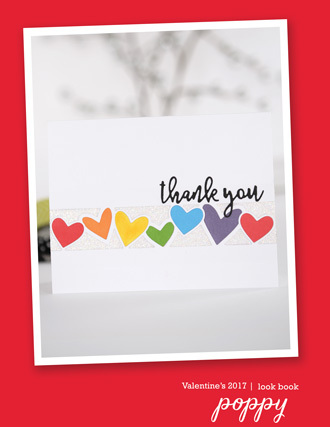 I stamped the sentiment on a strip of black cardstock and heat embossed it with white embossing powder. Using foam tape I glued it across the bottom of the trees. To finish the card I added a black mat behind the card front and glued it to a white cardbase. I also a glued a star to the top of the middle tree. Cool Cat poses among a trio of Looking For Mr. 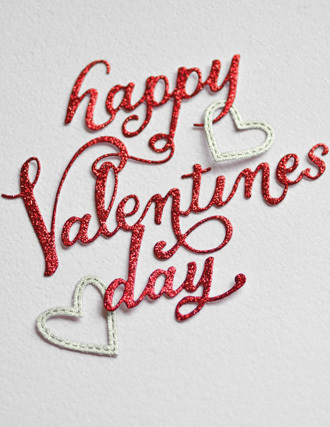 Right Triangles on an any-occasion card today. 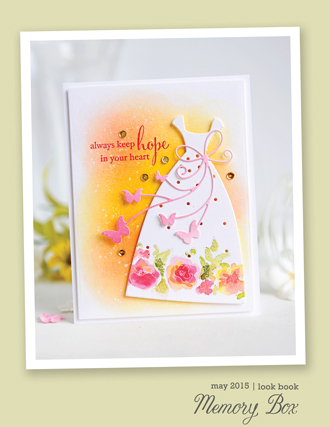 The Kaleidacolor-ed background anchors the stamped triangle diecuts and gem stickers add a bright touch. 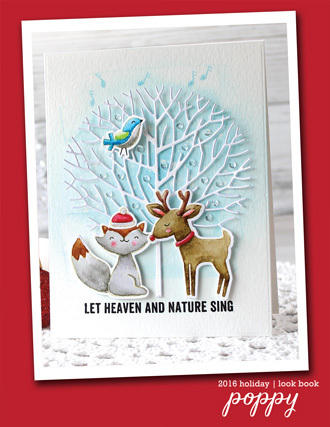 Hi there - Jean Okimoto here with another triangle card - I love these new stamps and coordinating dies from the 2018 Holiday Happenings Collection...hope you do too! Press Dessert Heat Kaleidacolor onto an acrylic block - keep the colors separated as though the inkpad is in storage. 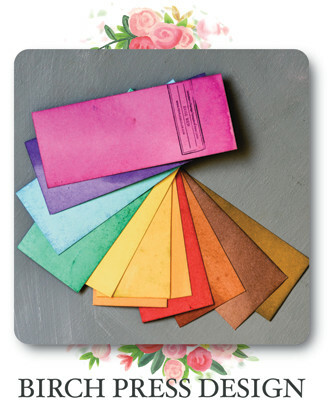 Quickly paint watercolor paper with wide streaks of each color. Let the colors blend randomly where they overlap - don't try to paint beautiful bands of color. Set it aside to dry. 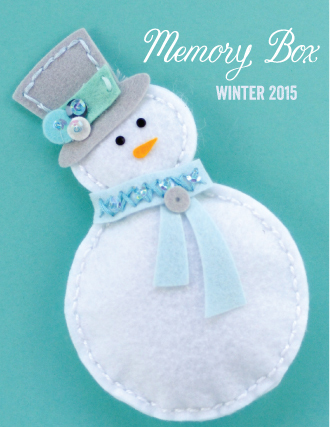 Cut it with the 2-¾" x 4" Wrapped Stitch Rectangle die. Stamp the smoother side of watercolor paper with the big solid triangle from the Looking for Mr. Right Triangle set three times. I've used VersaFine Clair Glamorous and Charming Pink and VersaFine Habanero. 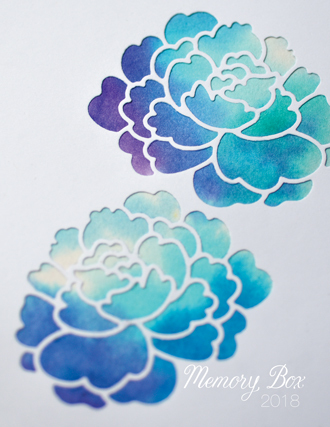 Don't forget to clean - and dry - the stamp when switching colors. Dry the inks. Stamp them with the small lined triangles and VersaFine Clair Nocturne. Dry the ink. Cut them with the 1-¾" die from the coordinating set. Cut Cool Cat from charcoal glittered paper. 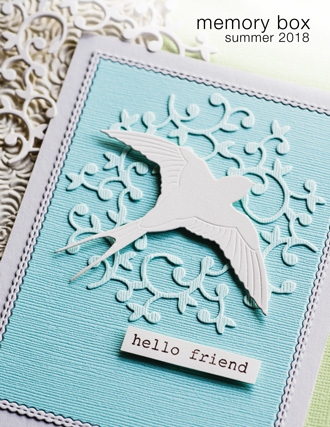 Attach the diecuts to a dark gray A-2 card. Add pale orange gem stickers. Know someone who loves cats - and is looking for Mr. Right? 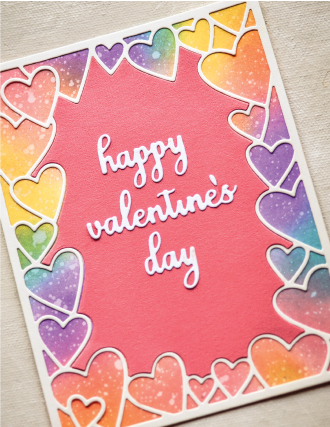 Send her a card - in her favorite colors - and brighten her day! 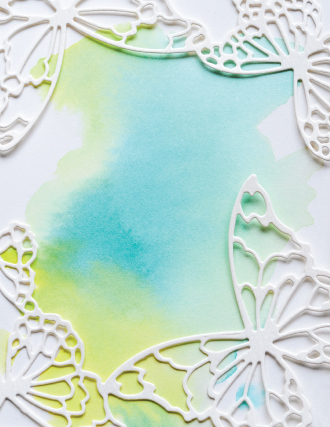 There are so many ways to use the new triangle dies and stamps with all of the great inks and papers available right now. Enjoy! I had some fun this week playing around with the new GRAND MAPLE FRAME 94079 and the HELLO JOTTED SCRIPT 94069 dies using a variety of papers and notecards that evoke the colors of fall in Maine. 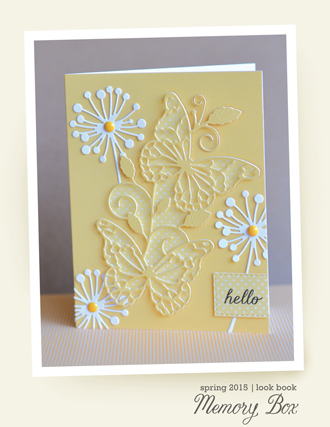 For this first card I used a mottled gold and brown paper on a copper metallic notecard. I used all three parts of the GRAND MAPLE FRAME die 94079--the outside decorative square frame, the plain circle that just fits inside it, and the maple leaf circle oriented with the stem at the top. 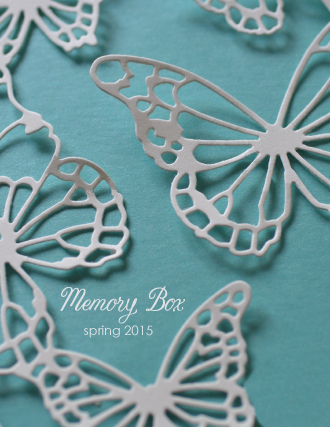 The HELLO JOTTED SCRIPT die 94069 comes in two parts. I cut the larger outline from brown cardstock and the detailed "hello" from more of the decorative paper and adhered them together with a glue pen. I used a5 1/2 X 4 1/4 copper metallic notecard. 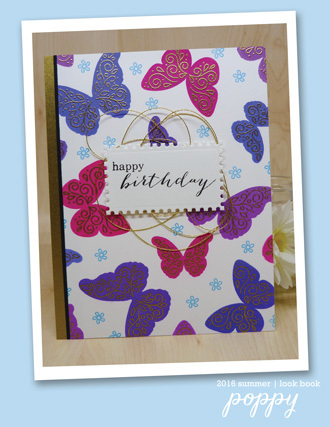 For the second card I used a scrapbook paper that was printed with a cork pattern. 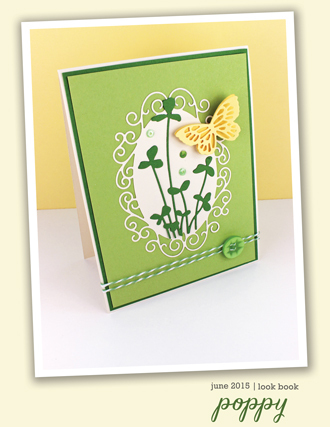 I used the frame and the maple leaf circle on the front of a Vanilla Bean notecard. I slid the maple leaf circle toward the bottom of the frame and tilted it just a little bit so the stem leans toward the bottom right. 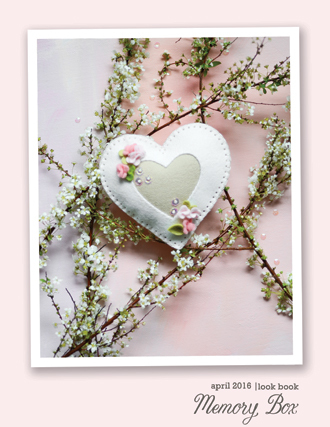 I used the plain circle inside the card to mark the area where I will write a message. And I used more of the brown cardstock and the cork paper for the "hello" on the card front. For the third card, I used a top-folded glossy black notecard and some tiger fur patterned scrapbook paper. And on the inside I added half of a large scallop-edged circle, the plain circle from the Grand Maple Frame, and the "hello" cut from more of the tiger paper. Before I mail the cards to out-of-state friends I have one more project to enclose in each envelope. Remember when we were kids and we used to press leaves between sheets of waxed paper to preserve them? I have a pile of leaves from the yard in colors similar to the papers I used, some waxed paper, an iron, and a pressing cloth at the ready. I thought it would be a nice surprise to have a pile of colorful Maine maple leaves fall out of the card when opened! Happy fall!!! Hello and Welcome! 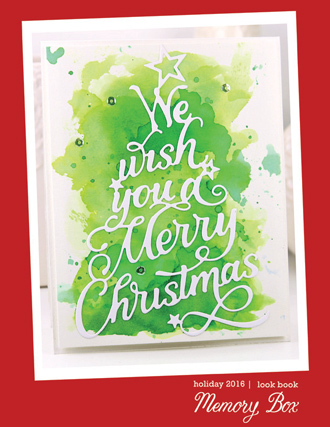 It's Isha and today, I want to share a CAS Christmas card using dies only. 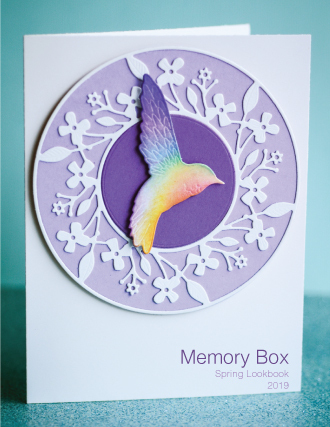 I really love how we can mix dies from various releases. To start, I created a red square cardbase. 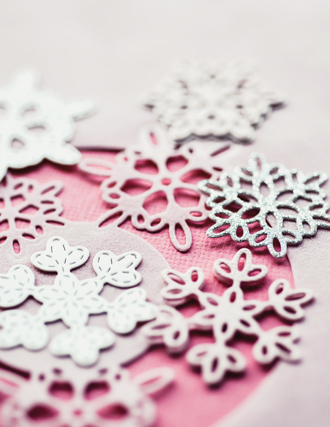 I then cut a kraft mat layer and added some gesso flicks to create a look of snow. 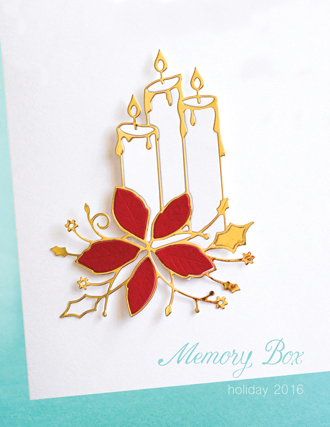 Once dry, I used the Holly frame and embossed the layer instead of die-cutting it. I then die-cut the Holly frame in white and adhere it to the mat layer. 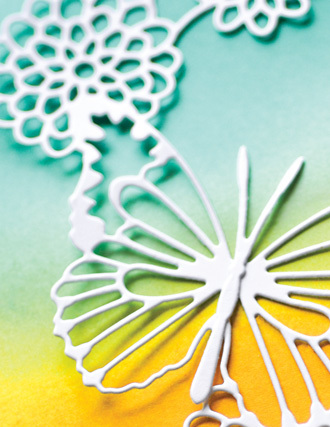 Embossing the frame and then adhering the white frame on top gives a nice dimension. I then die-cut the Candle trio using white glitter cardstock and added some color to the image using zig clean color real brush markers. I sponged some distress oxide ink to create the candle glow and the base. I then adhered the candles to it. 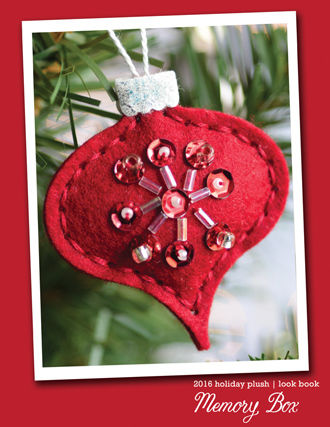 To finish, I added some red sequins to the card.